Advice on installing a consumer unit. Instructions on wiring a consumer unit to UK specifications for dual RCD and RCBO consumer units. Here is a detailed explanation of the consumer unit and how it should be installed in the UK. Warning: To complete electrical works you must comply with Electrical Regulations. Click here for more information. All cables and connections to the consumer unit must be checked and tested by a qualified electrician. Do not attempt removal or replacement unless you are you are qualified to Part P regulation standards. It is also an offence to interfere with the seals on the electricity meter. Please see our project on Part P of the building regulations for information on DIY Electrical Installation. The modern consumer unit is the centre, or heart, of the wiring system in the home. The unit distributes the electricity, via fuses of one kind or another, to the different circuits in the house. The older fuse wires are being replaced gradually by their modern equivalent, the MCB or miniature circuit breaker. What are the Different Types of Consumer Unit? We will deal with the two main types of consumer unit found in the home today. The first one is a single load fuse board where the power coming in is taken through a double pole switch to a live bus bar. 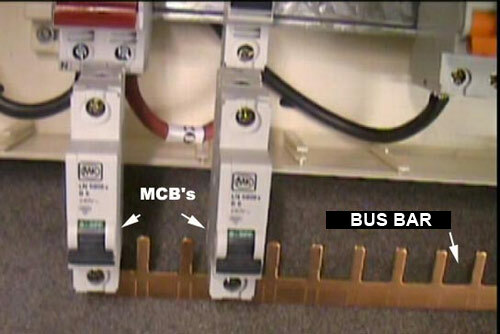 Each fuse, or MCB, is clipped onto a DIN bar and the "teeth" of the bus bar are inserted into the MCB’s. 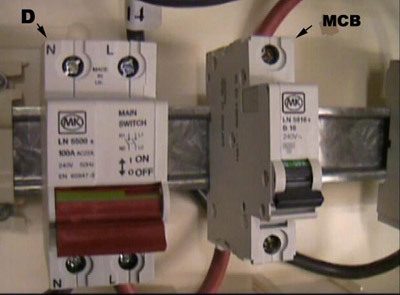 The cables to the house circuits are connected to the other side of the MCB’s. All of this is explained more thoroughly when we deal with the second type of unit, which is the split load unit. The photographs are of a split load fuse board. The ordinary consumer unit is exactly the same in principle without the RCD. The key to the above image is.. Under the 17th edition regulations it is required that every socket is protected by an RCD. This can be done in 3 ways. A consumer unit can use an RCD as the main switch. This will protect all circuits but if the RCD trips, so do all circuits. A dual RCD consumer unit can be fitted. This unit has one main switch, two RCDs and each circuit has it’s own MCB. This allows the circuit to be divided into two, usually one upstairs, one down. This protects all areas including showers and cookers, but if one trips the other will ensure at least some lights and some sockets still work. An RCBO consumer unit has one main switch but each circuit is protected by an RCBO which is a combination of an MCB and an RCD. This allows protection in full for all individual circuits and if one trips, all others will still work. As this option is expensive it is only usually used where space is tight for the enlargement of a consumer unit as has to happen when updating to a dual RCD unit. Just as a matter of interest, DIN stands for Deutsche Industrie Norm and, originating in Germany, is any of a series of technical standards, used internationally, to designate electrical connections, film speeds and paper sizes. Shown in the consumer unit casing above, it is a metal, pressed bar, to which the MCB’s clip. They simply push on via a spring loaded lock at their back. 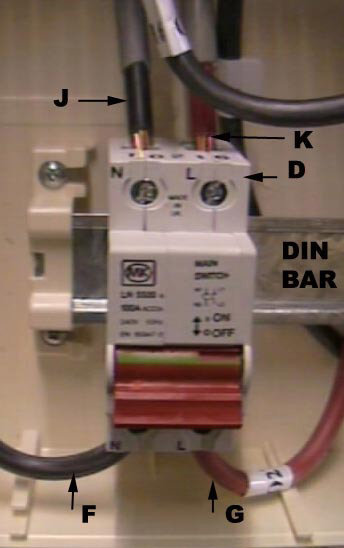 A split load board is designed for total safety and incorporates an RCD (Residual Current Device, shown as E in the picture above) as well as the double pole switch (D). The split board shown here has one RCD and is a simple version to show the user how the board works. An RCD is a manually operated isolator switch, but it is also an automatic safety device that will trip and cut off as soon as it senses an earth fault. There are a number of different ratings for current and sensitivities to current leakage available, so you will need to understand which are the appropriate ratings for your home. RCD’s also work by detecting an imbalance between the Live and the Neutral conductors and this feature is a requirement for all Class 2 double insulated equipment. As they are very sensitive, it is not practical to fit one RCD to protect the whole house. If a fault develops on one circuit, all circuits would be switched off immediately. This would, most often, leave you in the unnecessary position of having no lights or power. Because of this it actually contravenes the most recent (16th Edition) wiring regulations. This is easily prevented by using an RCD in conjunction with a main, double pole isolating switch so that it protects only some of the more vulnerable circuits. This then becomes a split load consumer unit and is shown above. The use of RCDs is necessary, on two occasions, to meet the wiring regulations. The first of these is to protect any socket which may be reasonably expected to supply equipment outside the house (Strimmers, lawn mowers, hedge trimmers, pond pumps, sheds, lights etc etc). This rule pretty much covers every single socket in the house so the ring main should be placed on the RCD protected side of the consumer unit. RCDs have a test button which creates an earth leak with a resistor, and it is usually recommended that they are tested once a month. An information label near the consumer unit explains this. The resistor passes more current than that required for tripping, and the duration of the test is not limited, so testing in this way does not provide proof that the unit is working to specification. 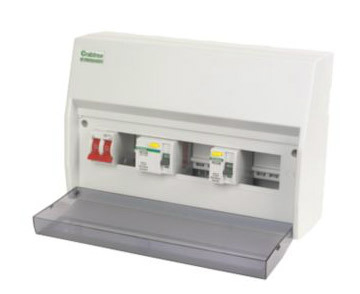 RCDs can also be switched off manually and can take the place of the isolator switch in the consumer unit, if they break live and neutral. The second condition applies to any circuits where an earth fault current is not sufficient to blow the fuse, or trip the switch, in the designated time allowance made in the regulations. This generally applies to higher Amp rated appliances (showers, cookers etc) but it should always be checked with an electrician as to which circuits need to be placed on the RCD side of the consumer unit. The Current ratings which MCBs are designated to deal with are now conforming to the international equivalent of our old imperial ratings. This standard is called the Renard current rating and supercedes the imperial ratings as far as MCBs are concerned. 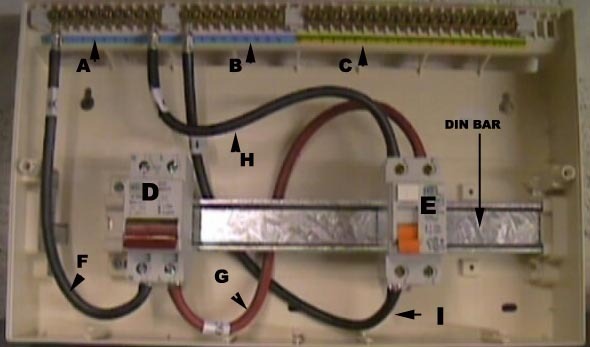 The image below shows the mains double pole isolating switch and an MCB clipped into place on the DIN bar. The image below shows two MCBs and the bus bar. When the MCBs are clipped onto the DIN bar, the bus bar is inserted into the live terminal at the bottom of the MCB. When screwed tight this gives live feed to all the MCBs. In the image below, this shows the live (K) and neutral (J) coming into the main double pole switch from the meter. These cables are called tails, and in this instance, with this type of unit, are 16mm cables. This will vary and you should always check with a qualified electrician. In the image below, we show the earth cable from the meter (L). This screws into the earth terminal block (C). We also show how a circuit cable is introduced to the unit. In this case it is a 2.5mm cable for the ring main. The live (O) is fixed into the top of an MCB on the RCD side of the unit, while the neutral (M) goes to the RCD neutral terminal block. The earth (N*), which has been left unsheathed for clarity, goes into the earth terminal block (C). 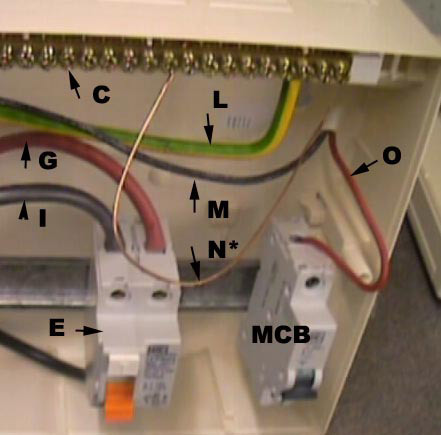 Each circuit cable is fed into the consumer unit and connected to an MCB of the appropriate rating.